I encourage you to stop sabotaging yourself at once. When in a “the glass is half empty”- mindset, there are a thousand little reasons which people find in order to tell themselves that they are not good enough, not worthy, not lovable, not great the way they are etc. – and all of these reasons don’t do us any good. If you tend to be hard on yourself when it comes to your own achievements in life, here’s a little exercise that can help you focus on the good side of things, the side that gives you energy and inspiration to move on. It is also helpful when you want that extra boost of self esteem or inspiration when you’ve just slipped off track. Instead of focusing one everything that you didn’t achieve, didn’t do properly, didn’t try etc., the goal is to get you focused on everything that you have achieved in your life. With that mindset you can be much more at ease about the moment you’re in, looking back at all the great things on your road, and from there create a positive attitude towards the goals and plans that make sense for your life now. 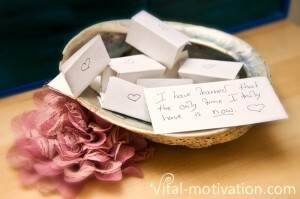 Write down all the major things that you have achieved in your life, each of these on a separate little piece of paper. Look at your achievements daily. Take all the notes out of the bowl one by one and read through all your achievements. If you’re currently very strict with yourself when it comes to your achievements, two to three times a day is a good idea. Keep your achievement bowl (mug, shell, whatever you picked) up to date: Add new things as they come up and clear out the things that have become a part of your conscious attitude through this exercise. The major achievements in your life don’t have to be huge things, you know best which decisions in your life were the important ones. Allow yourself to look at all the achievements on your road as equally big, it’s your perspective that turns them into the major ones. Life is made up of many little moments.